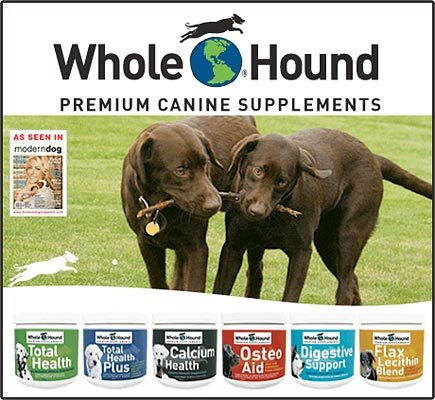 Whole Hound Premium Quality Canine Supplements are a comprehensive range of premium quality, nutritional supplements that strengthen and support canine health and complement all types of dog food. In 2008, we decided to create Whole Hound Inc. for the purpose of educating consumers and sharing our 10 years of experience using our premium quality nutritional supplements. Our goal is to help facilitate optimum health in dogs by promoting a 3 Steps Forward approach to feeding: GREAT FOOD + GREAT VITAMIN/MINERAL + GREAT ESSENTIAL FATTY ACID (EFA). Total Health is a comprehensive, daily vitamin mineral supplement and is designed to complement all types of dog food. We use moderate quantities of high quality ingredients, which makes Total Health an excellent complement to every type of dog food. Vitamins and minerals are necessary for proper growth, health maintenance and disease prevention. Just like humans, dogs benefit from a daily dose of high quality vitamins and minerals. Supplementing quality vitamins and minerals into your dog’s diet can help make the difference between average and optimum health. We don’t use any additives, preservatives or fillers, which makes Total Health highly concentrated and therefore extremely economical. Total Health Plus is a comprehensive multi-vitamin and mineral blend with digestive enzymes and the nutraceuticals Glucosamine HCI and MSM. Total Health Plus is recommended as a daily supplement and is designed to complement all types of dog food. Supplementing vitamins and minerals into your dog’s diet can make the difference between average and optimum health. Vitamins and Minerals are necessary for proper growth, health maintenance and disease prevention. We add digestive enzymes which, in addition to improving digestibility and decreasing stool weight, have been known to provide natural relief in the following areas: dry or scaly hair/coat, skin problems, digestive disorders, joint difficulties, immune disorders, excessive shedding, weight problems, allergies, bloating, lethargy, hairballs, flatulence, coprophagia, and wound healing. Glucosamine & MSM work together to decrease pain and inflammation while regenerating joint components and synovial fluid, and are recommended for facilitating pain relief, reducing inflammation, treating skin conditions, rebuilding connective tissue and joint components (pre and post surgery), treating disk disorders, spinal disorders and sprains, maintaining respiratory, digestive and urinary tract health, and to support working or athletic dogs. Total Health Plus is designed to help dogs grow strong and live long. Calcium Health is a comprehensive mineral supplement containing organic, naturally occurring minerals and trace elements. Minerals are essential for health, contributing to proper skeletal development, skeletal strength, mental and physical well-being, hormonal balance, development and preservation of the heart, brain, muscle and nerve systems, proper PH balance, and the creation of antibodies. Minerals work together with vitamins to facilitate proper digestion and they play a crucial role in the utilization of nutrients from food. Osteo Aid is a comprehensive joint support supplement containing marine source Glucosamine HCl, MSM, Glycine, Vitamin C, Calcium and Magnesium. The ingredients in Osteo Aid have been known to facilitate pain relief, reduce inflammation, and rebuild joint components, including connective tissue and synovial fluid. I adopted my awesome lab/bulldog from the pound as no one wanted him cause of a leg limping issue. Well I searched high and low until a nice lady at my local pet food store mentioned The Whole Hound. I started him on Osteo Aid and I was SHOCKED at what I was seeing. My dog went from limping and dragging his back left leg to jumping and playing at the dog park in about 1 month. I will now NEVER run out of Osteo -Aid. Thank you so much for making my dogs life better ! Digestive Support can be used therapeutically and is highly recommended when feeding dry or cooked food. This formula is a multi-enzyme blend of non-animal based enzymes specially formulated to assist the digestive system in dogs. Digestive enzymes are extremely important to a dog’s health. Digestive enzymes aid in the decomposition of high molecular weight substances to ensure your pet gets the maximum possible nutrition from their food. In addition to improving digestibility and decreasing stool weight, digestive enzymes have been known to provide natural relief in the following areas: dry or scaly hair/coat, skin problems, digestive disorders, joint difficulties, immune disorders, excessive shedding, weight problems, allergies, bloating, lethargy, hairballs, flatulence, coprophagia, and wound healing. Flax Lecithin Blend is designed for daily use WITH one of our multi-vitamin mineral supplements. Like humans, dogs require Omega 3 Essential Fatty Acids daily to for proper growth, including brain development, health maintenance and for disease prevention. In addition, Omega-3 EFAs are critically important for neuromuscular development, skin health, coat quality and are often taken to help inflammatory skin diseases, infections, arthritis, and flea and food allergies. This OMEGA-3 FLAX is a stable, highly concentrated source of the Omega-3 essential fatty acid (EFA), Alpha-Linolenic Acid (ALA). This unique supplement brings the Omega-3 EFA's back into balance with the omega-6 EFA, Linoleic Acid (LA), already present int the diet, resulting in numerous benefits. An imbalance in EFAs commonly results in inflammation and dermatitis. Why Should My Dog Use Supplements? Because science has proven, and veterinarians agree, that nutritional supplements help facilitate proper growth in puppies, maximum health in adult dogs and disease prevention in dogs of all ages. I Feed My Dog A Healthy Diet. Do I Still Need To Supplement? YES! Not enough dog lovers realize the importance of nutritional supplementation in the form of vitamins, minerals and essential fatty acids. Nutritional supplementation, used in conjunction with a high-quality diet, not only makes the nutrients in the food we feed more available to our dogs, but it also enhances recovery from stress, injury, and illness, while helping prevent the onset of many degenerative diseases, such as arthritis, cancer, heart disease, gastrointestinal problems, and skin disorders. My Dog Is On A Prescription Diet. Can I Still Supplement? YES! Whole Hound supplements are free of all artificial ingredients, sweeteners, preservatives and do NOT contain common allergens. Appropriate nutritional supplementation will help make the nutrients that exist in prescription foods more available to your dog and will play a supportive role in health recovery and maintenance. Nutritional supplements help over time, not overnight. We recommend using nutritional supplements consistently for a minimum of 30 days before gauging results. Having said that, many people see benefits after 2 weeks. For best results, use daily. Order Your Whole Hound Supplements Today! You try to protect your pet’s health with good nutrition and exercise, but without Whole Hound Supplements your pet is missing vital nutrients. Make sure your pet has the health tools necessary to live a happy and healthy life, order today!